As I wrote in my last post, I finished the first three rounds with 2.5 points, but I still wasn’t playing all that well. I had missed key variations and ideas in each of my first three games. In round 4, things were to get even worse. I had the white pieces against IM Jordan Ivanov, a solid IM I had drawn with in Seville earlier in the year. That was an up-and-down game where I missed a few opportunities and had to work hard to escape with a draw. I was prepared for his usual QGA, but around lunchtime, I developed a splitting headache. A couple of Tylenol numbed some of the pain, but at game time, I was more inclined to sit with an icepack on my head than to play a game of chess in the sweltering heat of Balaguer. Once it took me an hour to play out my preparation (and notice that I had already spent an hour), I realized it wasn’t my day, and I quickly tried to swap off some pieces. Luckily, Ivanov was not particularly ambitious that day (he had beaten GM Oms Pallisse the day before, but I guess with the black pieces, he went in being happy with a draw), and he didn’t try to avoid any of the exchanges. We agreed to a draw after 24 moves. Playing one degree with Ivanov, Oms Pallisse is the only player to have beaten me in a rated game when I played the Trompowsky. I’ve been a 1.e4 player for most of my chess career, but after a long break from regular tournaments, I started playing 1.d4 in 2005. To cut down on the theory I had to learn, I started with the Trompowsky against 1…Nf6 players. In 21 rated games with the Tromp, I scored 19.5 points. Most of the games were against players about 150-200 points lower rated than me, though. GM Larry Christiansen also beat me in a Tromp in the US Chess League, but that wasn’t a rated game. Including such unrated games, my score in the Tromp moves up to 22.5 points from 25 games! Now back to Balaguer … If round 4 against Ivanov was a strange day, the next game was even weirder. I was black against IM Mathias Roeder. Roeder has 3 GM norms, but he’s never crossed 2500 FIDE. With the white pieces, he’s especially difficult to beat, and I noticed that for a stretch from the start of 2006 through part of 2008, he didn’t have a single loss in the database with white. For someone who plays about 100 games a year, that’s pretty solid. 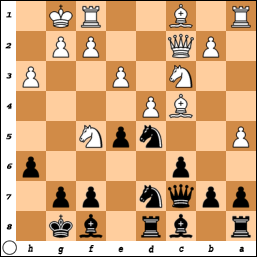 White has just played 11.Qd1-c2, and it’s now up to Black to find a reasonable plan. In general, his problem is that the central tension can’t be favorably resolved and so his queenside pieces will languish on the first rank. Black can’t push …e5-e4, and for the moment, …Re8 would leave f7 weak after Ng5. Meanwhile, if Black takes on d4, White will recapture with the pawn and achieve a very nice isolated-queen’s pawn position. Black can’t target the pawn, and White has the more active pieces. I ended up playing 11…h6? !, which is a somewhat provocative move that I didn’t really want to play. At the same time, I didn’t like the alternatives. Playing …h6 means that …Re8 is quite reasonable. 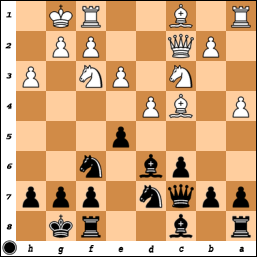 After …Re8, Black can think about …exd4, …Nf8, and …Be6 – the pawn on h6 shuts the Bc1 down in that IQP middlegame. The cost to …h6 is that it weakens the kingside light squares. With the bishop on c4, White might drop a piece into g6, or he might try and maneuver a knight to the soft f5-square now. Black can’t play g6 anymore because the pinned f7-pawn doesn’t actually guard that square. White immediately executed that maneuver with 12.Nh4. I responded with 12…Rd8. I didn’t want to go e8 in this position for two reasons: one, the rook takes away a square for the king in case of Bxf7+ and Qb3+; and two, there could be a time when if White sacrifices a knight on h6 and plays Qg6+ and Bxf7, the rook would en prise on e8. Now White made a clear mistake in my view, with the apparently natural 13.Nf5?!. After 13…Bf8, Black is now ready to play …Nb6 (there’s no pressure on e5 anymore), and so Roeder played 14.a5, cutting the knight down. This allowed me to unwind nicely with 14…Nd5!. After my week 2 win against Emory Tate, I sat out the next few matches and rejoined the team in its week 5 clash with the Boston Blitz. I lost that game in horrible style to GM Larry Christiansen (he’s now 2-0 against me, having beaten me in our previous encounter in China in 2002 – I had the black pieces in that game). It was the first time in ages I remember actually losing on time. The game can be replayed on the USCL website, here. I recapped the action on the entire week at the SF Mechanics blog, here. We lost the match by a score of 3-1 (although it easily could have been a 4-0 sweep from Boston). That dropped us to 3.5/5 in match-play and a tie with Dallas for first in the Western Division. It was my first loss of the year, and the team’s first match loss of the year. The following week, we played a division rival in the Arizona Scorpions. This match went much better for us. I had the black pieces against the strong IM Rogelio Barcenilla. Rogelio doesn’t play much anymore, but he had been rated near 2500-FIDE for years. The game was equal for a while, but then I got the advantage and was easily winning (up a whole piece after …Rxb3!). However, I was having trouble seeing more than 1 move ahead and with my head hurting, I managed to completely botch the win over the next 20 moves or so. The game ended in a draw, but we won the match anyways, 3-1. Actually, we could have had a 4-0 sweep if Naroditsky and myself were even remotely in form. You can see the game at the USCL site, here. The recap, again written by me, is on the Mechanics blog here. This win took us to 4.5/6 in match play this season, and we again took clear first in the West, as Dallas lost to Tennessee by a score of 2.5-1.5. There are 4 weeks left in regular season play, after which the first of 3 playoff rounds begins. Our history in the league has been pretty good – we won the Division in 2005, won the Division in 2006 (and went on to win the League Championsip) with the best team record in league history, and placed 2nd in the Division in 2007 behind later league-champion Dallas.